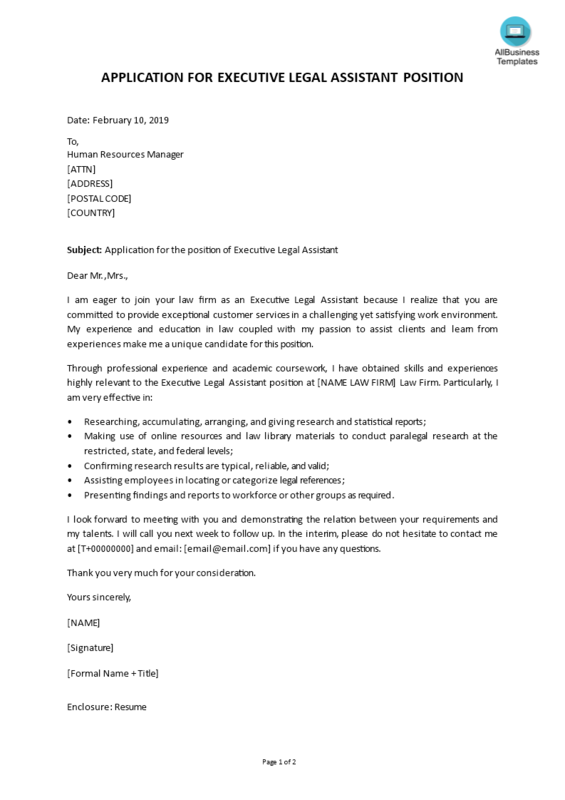 How to draft a professional Executive Legal Assistant Cover Letter? An easy way to complete your application letter is to start with this example Cover Letter template now! We provide this Executive Legal Assistant Cover Letter template to help professionalize the way you are working. Our business and legal templates are regularly screened and used by professionals. If time or quality is of the essence, this ready-made template can help you to save time and to focus on the topics that really matter! Using this Legal Cover Letter template guarantees you will save time, cost and efforts! Completing documents has never been easier! Download this Legal Cover Letter template now for your own benefit! Particularly, I am very effective in: Researching, accumulating, arranging, and giving research and statistical reports Making use of online resources and law library materials to conduct paralegal research at the restricted, state, and federal levels Confirming research results are typical, reliable, and valid Assisting employees in locating or categorize legal references Presenting findings and reports to workforce or other groups as required I look forward to meeting with you and demonstrating the relation between your requirements and my talents..